Fiji is one of the friendliest places in the world, mostly due to the Fijian locals. Grinning from ear to ear and always eager to share with you their traditions and culture, we had a complete local experience during our travels to this beautiful island. 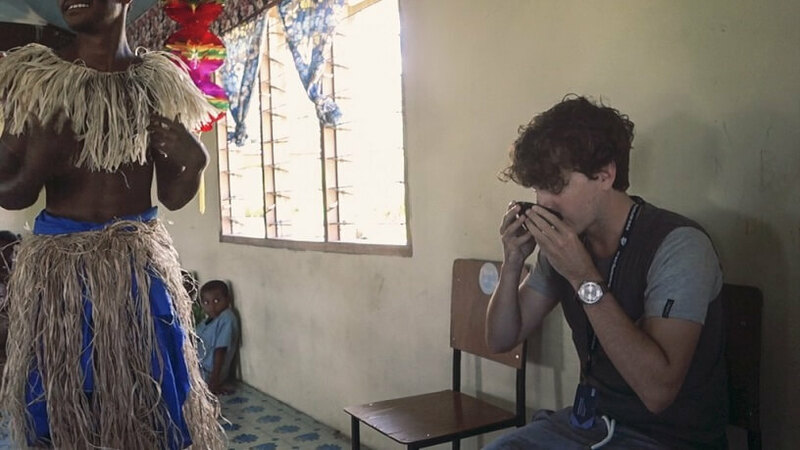 Here is how you can experience Fiji with the locals, just like we did. 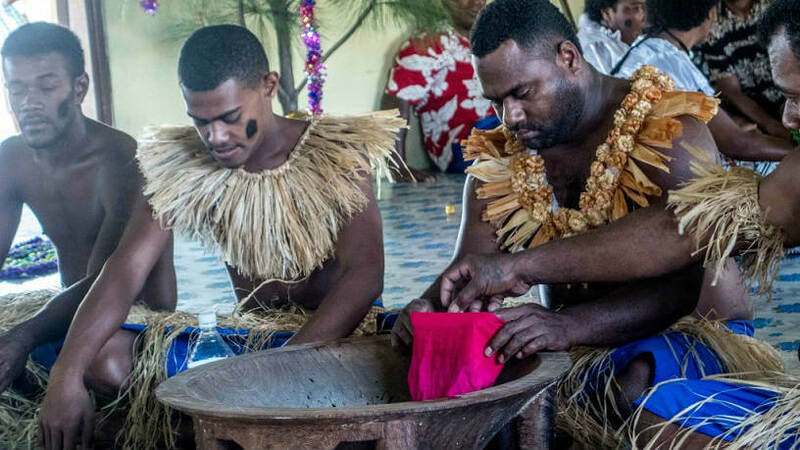 One of the most local experiences you can have in Fiji is attending a traditional Kava ceremony, held to accept new guests and travellers into a Fijian village. The main event includes a shot of Kava, after a big welcoming ceremony with plenty of singing and dancing by the villagers. Locally known as ‘vagona’ or ‘grog’ in Fiji, Kava is a narcotic drink made from a crushed powdered root. This powder is placed in cloth and mixed with water and gives you a numb feeling around the tongue, lips and mouth. The local Fijians believe the drink to have medical elements and it is the national drink of Fiji due to its ancestral past. During our ceremony we were greeted with a beautiful welcome song followed by the preparation of the Kava drink by the village leader, and guess who had to drink first? Yep, us! We were a little nervous to go first, the explanation on how to accept the offering was done very quickly and we did not want to mess up. We cupped our hands and clapped once yelling “Bula!” (which is the welcome greeting in Fiji), we then shot back our kava ensuring we finished it in one gulp before giving the cup back to the villager followed by clapping three times and saying “Mathe” (pronounced: may-tay). The Kava we had was weaker than usual so we only noticed a slight tingly feeling around our lips and tongue, nothing uncomfortable or numbing. It tasted earthy and ‘rooty’, as expected and our stomach happily accepted the local drink. 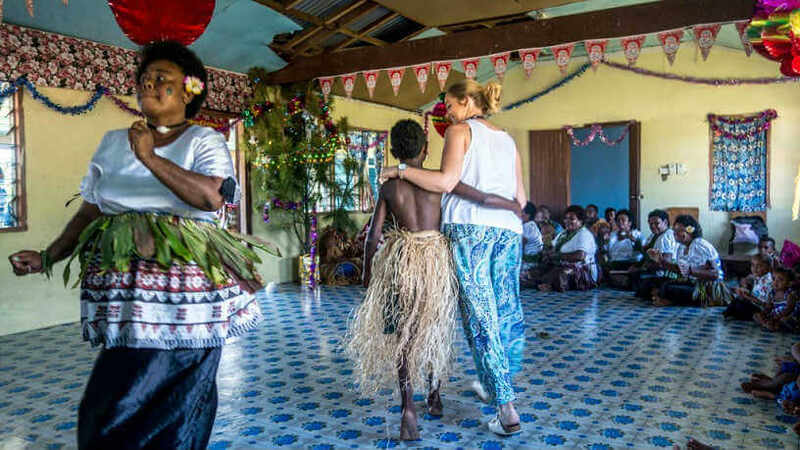 The rest of the ceremony was spent singing and dancing with the local Fijians, an experience we will never forget! 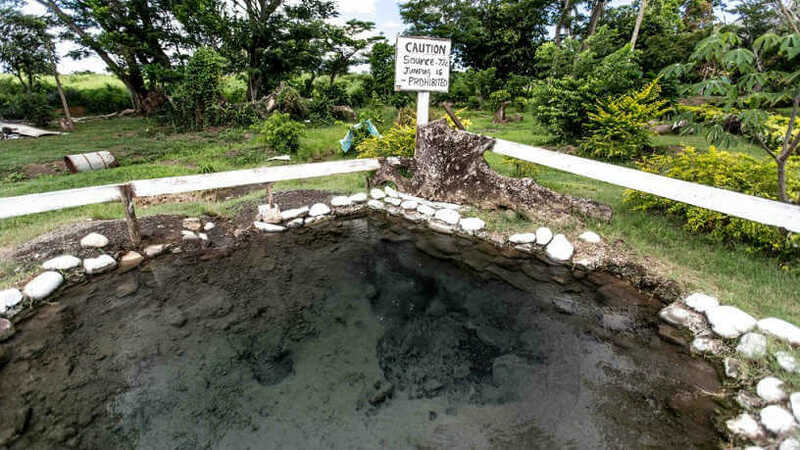 If you are wanting a day at the spa, Fijian style, you must come and experience the natural mud pools scattered across the island. Many Fijian locals spoke to us about the healing powers of their mud pools and we just had to try one out for ourselves. Once arriving at Sabeto Mud Pools we were greeted by a smiling Fijian who ushered us to a small hut to pop our swim suits on ready for a day in the mud. Don’t wear your best bikini as the sulphur in the mud can cause discolouration, plus you are about to be covered completely in mud! We were then taken over to our mud pool and given a large wooden bucket full of mud that had just been retrieved from the bottom of the pool and were told to start slapping it on. 10 minutes later we were covered head to toe ready to lay in the sun and allow it to dry. We listened to our guide as he shared stories about his life in Fiji and how the mud pools came about. He spoke to us about the mud’s healing powers and the benefits it has on one’s body, spirit and mind. When the mud began to dry and crack from our smiles, we made our way into the mud pool to wash it off. Jumping into a mud pool to wash off mud doesn’t sound quite right, does it? Unsure of what was lurking underneath, we scrubbed off the mud as fast as we could. Once we got out our skin felt silky smooth. We spent the rest of the afternoon soaking in the hot springs - which were mud free. We swam around and relaxed until we couldn’t take the heat any longer. Once we stepped out our muscles felt like jelly, they were so relaxed. Spend a day at a traditional Fijian village. Try some local cuisine, we suggest trying the unique dish Kokoda. Made of raw pieces of white fish marinated in coconut cream, lime, onions and tomatoes. The acid in the limes cook the fish and the coconut gives it a creamy flavour. Visit one of Fiji’s stunning beaches. There are many hidden beaches only the locals know about, just ask a Fijian and they will tell you where you should go. Stephen Parry travels the world fulltime with his fiancé Jess Valentine, sharing their adventures on their blog Flying The Nest as they go. In 2015 Stephen won Cover-More's Ultimate Traveller video competition.